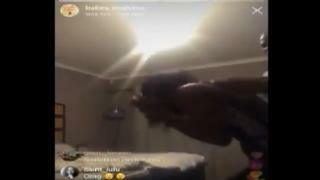 South Africans have reacted angrily to a live video of a singer being beaten by what appears to be her boyfriend. Babes Wodumo is trending on Twitter in South Africa, as is the hashtag #StopWomenAbuse. "1. We're absolutley [sic] horrified by the actions of Musician Mapmpintsha @MampintshaNuz caught on video where he brutally abuses Internationally celebrated Artist @BABESWODUMO," he tweeted, naming her boyfriend Mandla Maphumulo, also known as Mampintsha. "We do not only condemn this senseless act but call on @BABESWODUMO to immediately press charges against him," he added. Mr Maphumulo has not commented on the video but in relation to similar accusations last year, he denied being an "abuser", reports Times Live. But he also added that he was "no saint". "I may have overreacted in a couple of incidents during our relationship with her over certain things," he said. The singer, who featured on the Black Panther soundtrack, often collaborated with Mr Maphumulo, including on one of her most popular songs, Wololo. Violence against women is seen as a major problem in South Africa. A 2016 study by Statistics SA found that 1 in 5 women report that they have experienced violence at the hands of a partner. The singer's sister, Nonduh Simelane, told entertainment news site The Juice that the 24-year-old Gqom singer was "traumatised but doing okay and is resting". People watching the video expressed shock, with one saying "wait what?!" before later adding "not this again". Opposition political parties have also come out to condemn the attack. The EFF in KwaZulu-Natal says it intends to open a case with police to investigate footage, according to Times Live. Meanwhile, the leader of the opposition Democratic Alliance, Mmusi Maimane, said that he wanted to fight the man himself. He said on video that he "must go into a boxing ring and let's pick on someone his own size and I'd like to take him on". This is not the first time the relationship has become a matter of national debate. 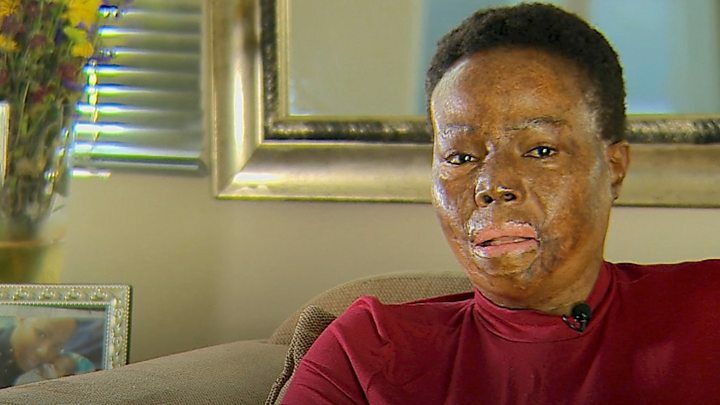 In May last year, she was asked in a radio interview if Mr Maphumulo was abusing her, which led to a discussion about the ethics of how the interview was conducted.